Durasens™ 10 cm pathlength transmission gas cells are designed to monitor gas streams in process environments using transmission spectroscopy. These cells are designed to be inserted directly into the beam of a spectrometer. These cells have an internal volume of only 17 mL and provide for the unimpeded flow of gas through the cell. The standard cell body material is 316 stainless steel with ¼” in/out tubing. Different materials such as Hastelloy are also available. The optical windows are available in a variety of optical materials such as Quartz, Sapphire, Cubic Zirconia, ZnSe, ZnS, CaF2, etc. The optional temperature control package (Model GT-10-T) enables these cells to be used at temperatures of up to 260°C. Durasens™ 30 cm pathlength gas transmission cells are designed to monitor gas streams in process environments using transmission spectroscopy. They can be used with FTIR spectrometers or with UV-VIS-NIR spectrometers for a wide variety of at-line and on-line process applications. The design of the cells allows for the high unimpeded flow of sample through the cell thus ensuring that the sample analyzed in the cell is the timely representation of the sample in the process line or reaction vessel. The cell pathlength is 30 cm. The cell volume is 150 mL. The standard cell body material is 316 stainless steel. Different materials such as Hastelloy are also available. The optical windows are available in a variety of optical materials such as Quartz, Sapphire, Cubic Zirconia, ZnSe, ZnS, CaF2, etc. Please contact us regarding your specific application. 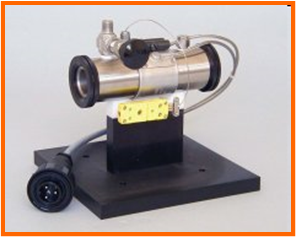 Durasens™ 300 cm pathlength transmission gas cells are designed to monitor gas streams in process environments using transmission spectroscopy. The cell features multiple pass optics to achieve long pathlength in a small volume. The light path folding optics is exterior to the cell so it never gets contaminated by the sample. The cell can be inserted directly into the beam of the spectrometer or it could be connected to the spectrometer via fiber optics.